NuLeaf Naturals is at it yet again, paving the way for exciting cannabinoid products with the aim of helping people live happy and healthy lives. And, they now have a 4850mg Full Spectrum CBD Oil for sale in their stores. Every product that is released by NuLeaf Naturals has been tested for both quality and purity. And, every drop of this CBD oil is tested and verified to contain a range of cannabinoids. 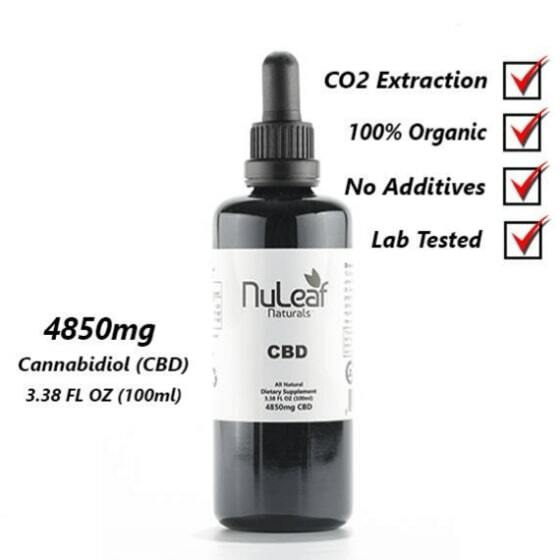 This effective product is packaged in a 3.38 fluid oz bottle, where one drop of it contains approximately 2.4 mg of CBD. Acute headaches: You will be able to effectively deal with migraines and headaches in general, by taking this NuLeaf product which has been proven to silence such pains. You shouldn’t have to use over-the-counter pharmaceutical drugs again when you have this product. Arthritis: This is a common medical condition among older people, where joint pains become more rampant. But this product may be able to silence some of the joint pains of arthritis. Chronic back pain: Many people nowadays complain of back pains when they either stand or sit for too long – it can get so serious that it even affects the way people walk. You shouldn’t have to struggle with mobility because of a painful back. The good news? Full Spectrum CBD Oil 4850mg should provide some relief. Insomnia: Plenty of people suffer abnormal sleep cycles or find that they can’t get to sleep at night. Get the sleep you need by taking this product. Tremors: This condition can be very painful to the extent that you lose peace of mind from a lack of rest. Whenever tremors appear, don’t suffer the pain, just deal with it outright by using this NuLeaf product. Depression: Say no to accumulated stress and anxiety by having this product by your side. Take the required medication to reduce your levels of depression. Quality: By using the CO2 extraction method, this organic full spectrum CBD Oil is obtained from hemp plants that have been grown naturally without herbicides, chemical fertilizers or other pesticides. This type of extraction ensures that the quality and purity of this dietary supplement is maintained. It is further lab-tested to ensure it is effective and free of heavy metals. Effects: By placing your required dose under the tongue for around 30 seconds, you experience the full effects of this 4850 mg Full Spectrum CBD Oil. It deals with conditions like depression, migraines, chronic pains, and arthritis, among others. Final Thoughts: If you are looking for a CBD supplement that will give you the ultimate relaxation, look no further.